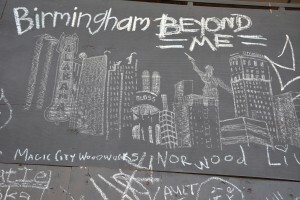 A chalk drawing of Birmingham’s most distinctive sites on a wall on 3rd Avenue North. 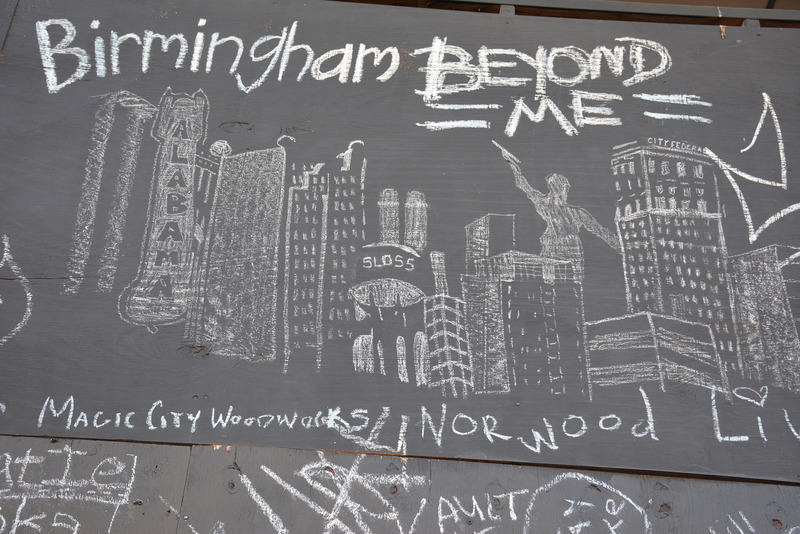 The landmarks of Birmingham’s skyline are easily recognizable – Sloss Furnaces, the Vulcan, the Regions building and City Federal, among others. From the streets, however, the variety of doorways in the city are a glimpse into how Birmingham’s architectural tastes have changed over time. Below are just a few of the unique entrances around the city. 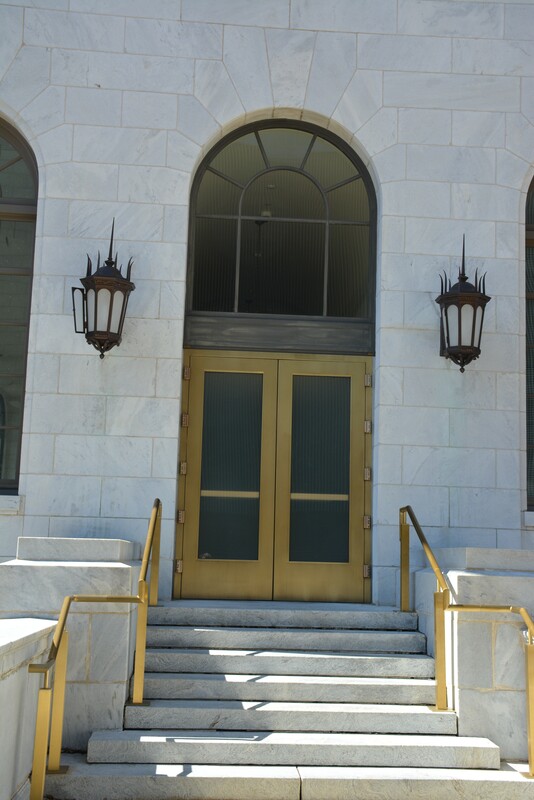 The geometric metal and gold design of the Alabama Power headquarters entrance reflects the art deco style popular when the building was originally constructed, in 1925. 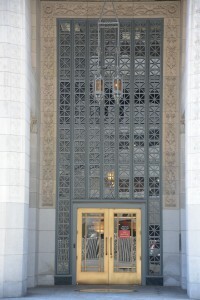 The building was restored in the 80s and the headquarters complex added in the 90s, but the art deco motif remains in the original doors and the gold leaf-covered statue of Electra on the building’s roof. One of downtown’s older buildings is First United Methodist Church, which was built in 1891 and holds services to this day. 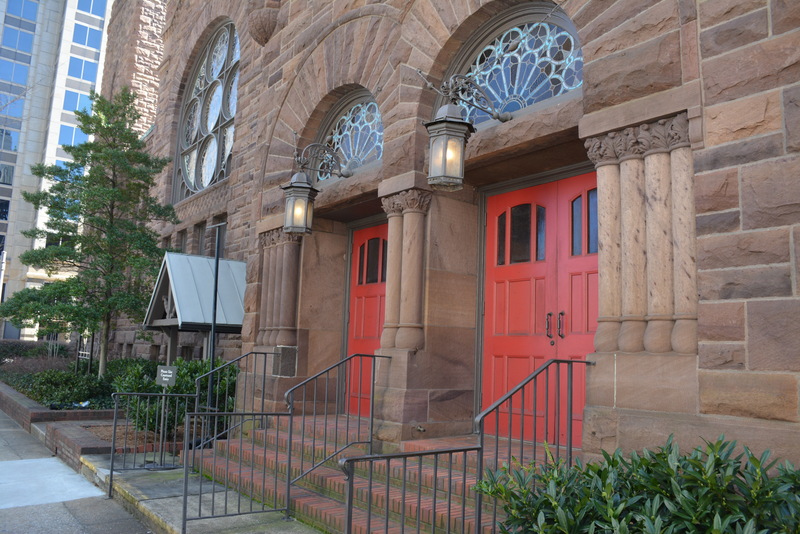 The church, built in the American Romanesque Revival style, cost $160,000 to build, a steep sum for the time. The church’s stained glass and towers lend it the appearance of a European cathedral or castle. 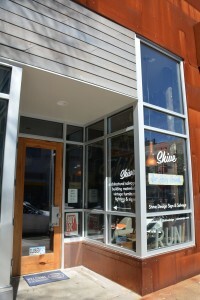 It is now on the Register of Historic Places. 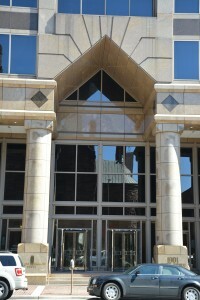 Across the street from First United Methodist, the Regions Harbert Plaza was built in 1989 on the former site of the Temple Theater. 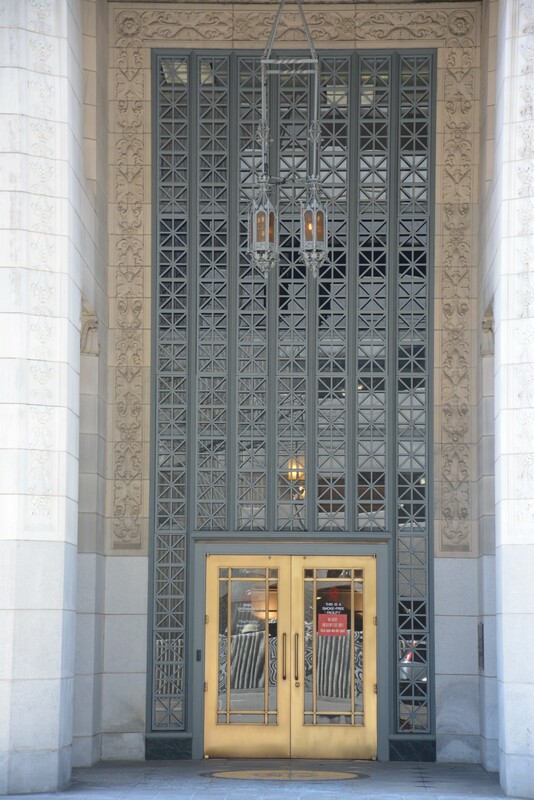 The plaza’s entryway features a post-modern style (as well as revolving doors that I was tempted to run through). The colors of the building were chosen to reflect its other religious neighbor, the Cathedral Church of the Advent. The courthouse is more recognizable by its long row of columns facing 5th Street, but I found the side and employee entrances to be striking as well. 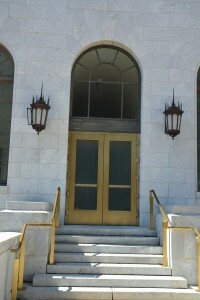 The gold door, arched window and lamps stand out from the white marble wall and steps. The courthouse was built in 1921 in the Classical Revival style, and later named in honor of Circuit Court Judge Robert Vance after he was killed by a mail bomb in 1989. 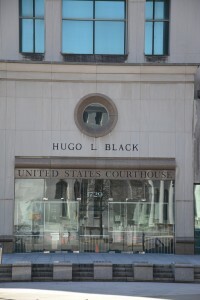 Across an intersection from the federal building, the Hugo Black Courthouse was built in 1987 for the federal district court. Despite the modern look of the glass-encased upper stories, the entry to the courthouse is built using limestone and a more classical style. 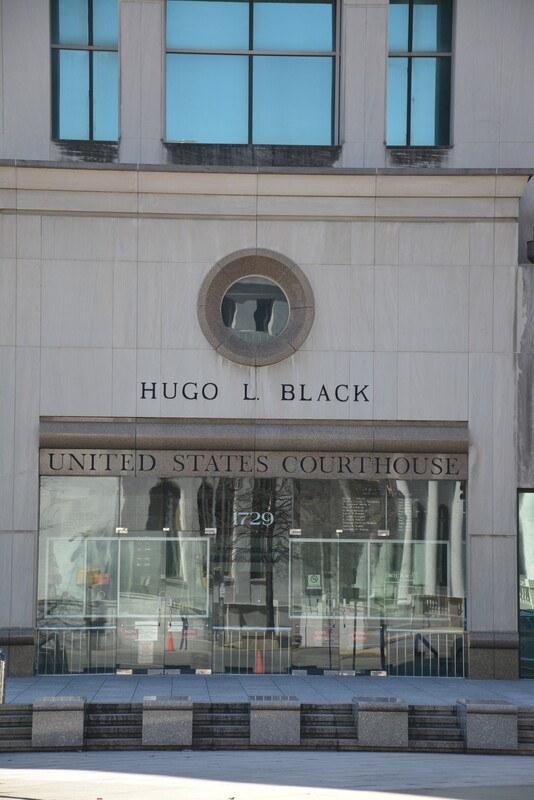 The courthouse is a blend of classic Birmingham architecture and more modern tastes. 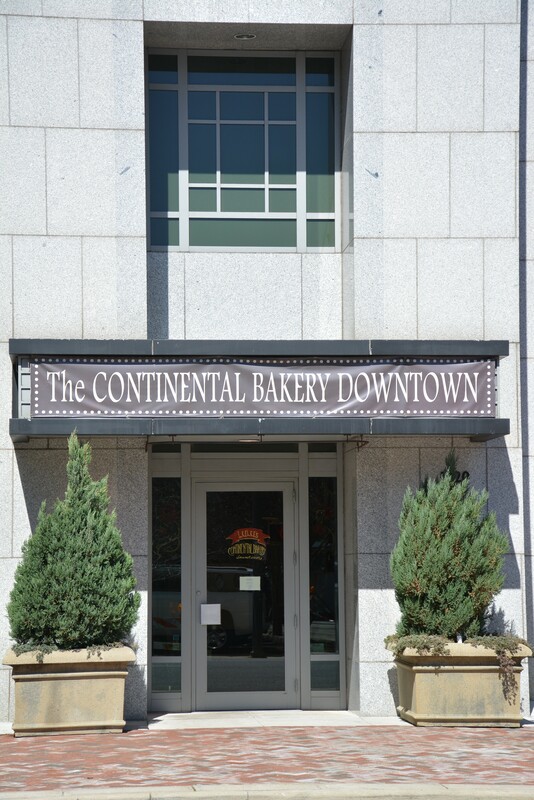 The cousin of Continental Bakery and Chez Lulu in Mountain Brook, Continental Bakery Downtown opened in 2014. The French-style bakery’s sign mimics an old theater marquee, an intentional choice by the owner, Carole Griffin, to reflect the bakery’s placement near the Alabama and Lyric Theaters. 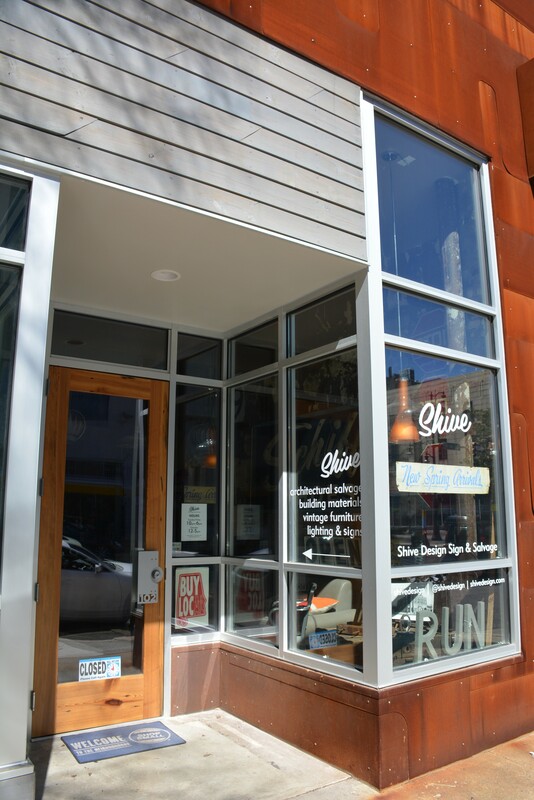 The Whitmire Lofts building, home to Shive, Revelator Coffee and residential lofts, bears little resemblance to the original 1912 construction. Appleseed Workshop, an offbeat design-build firm in Birmingham, overhauled the building into an ultra-modern steel and faux-wood exterior. The steel design is patterned after the Lyric Theater, which is right down the street. 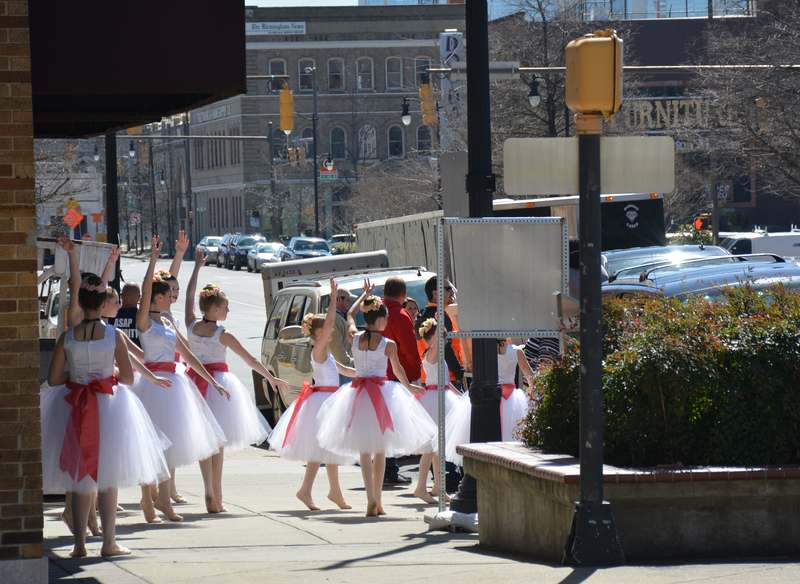 Lastly, as I passed by the Lyric on Saturday a group of young ballerinas were preparing for a performance. No doorways in sight, but too adorable not to share.